The table porcelain factory, near the Sorgau railway station (Nieder-Salzbrunn, now Szczawienko), on the Wałbrzych – Wrocław route and in the close vicinity of the Książ castle, was built by Hermann Gustav Ohme, a businessman from Wałbrzych. The construction of the factory was possible with the financial support of the wife Anna Ohme (née Dimter), niece of Carl Krister, who died in 1869, and the cooperation of ceramic engineer Ernst Maria Bauer (son of the technical director of the porcelain factory Carl Tielsch)..
Porcelain production begins in 1882. Initially, the factory had two large muffle furnances, fired with hard coal. In 1906, a gas plant and a factory for burning porcelain are created at the factory, and the use of gas-fired furnaces begins. In 1917, the factory already has 17 ovens. 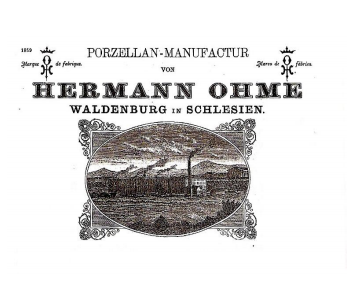 From 1881 to 1921, the factory was owned by Hermann Gustav Ohme (senior). From 1923 until the factory was shutdown in 1930, the factory was owned by his son Hermann Alfred Ohme (junior). Old Ivory porcelain sold for the US market was additionally marked with an appropriate signature confirming it’s type and decoration number. To date, over 80 different types of decorations have been identified in the number range from No. 4. up to 204 and many unidentified ones marked with the letter U and number. On 9 October 1929, Porcelain Factory Hermann Ohme, was sold at auction. The factory was bought by Carl Hamich, a businessman from Wałbrzych. The residential house of the Ohme family in Szczawienko was purchased by Feliks Reichert from Wałbrzych. To this day, the paint shop has been preserved, a hotel building for girls working on porcelain decorating, an administration building, a few houses of factory workers and a family home of former factory owners. During World War II and immediately after it, existing buildings were used as barracks by German, Soviet and Polish armies. Currently, the paint shop houses stores and warehouses, and the builind “for girls” is now a hotel. The home of former factory owners, now is beeing partially used as an orphanage, and most of the rooms are occupied by various service companies. The text comes from a book prepared by Adam Szynkiewicz.